Major Butch Frost joins Cracker Barrel this morning to talk a little Salvation Army. The Salvation Army is at 31% of their goal. Last year (same time last year) was at 48%. They need your help to reach their goal. Tree of Lights vs. Red Kettle Campaign. What’s the difference between the two, and why the change? Taking care of the community. What are some of the programs that the Salvation Army of Springfield do? Financial aspect of the Salvation Army – volunteers vs. non-volunteers. 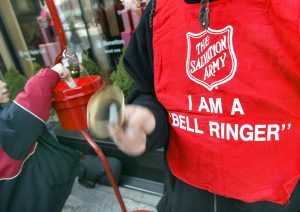 How does the Salvation Army get their bell ringers? Toy donations for Christmas, and what they’re looking.